The range topping new Street Triple RS is the most explosive and adrenalin-charged Street Triple we’ve ever built. At home on the track, and a weapon on the road, it literally tears up the rulebook and sets a whole new standard. Taking the specification to the highest level its additional features include the most powerful engine specification in the family, Brembo M50 monobloc front brake calipers, fully adjustable Showa ’big-piston’ forks, Öhlins STX40 fully adjustable rear monoshock, an additional ‘track’ riding mode, lap timer, quickshifter and Pirelli Diablo Supercorsa SP tires. TFT SCREEN: The Street Triple R and RS models feature an angle adjustable, full-color 5” TFT instrument pack that allows users to access the host of state-of-the-art rider-focused technology available from the new on-board computer. 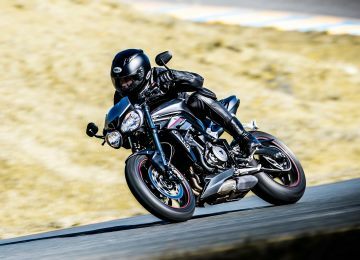 SWITCHABLE TRACTION CONTROL: Switchable traction control manages both power and torque when the traction is compromised, to maximise rider safety and control. HIGHER SPECIFICATION SUSPENSION: This Street Triple range is fitted with a higher specification suspension all round, developed and tuned specifically for the latest models. 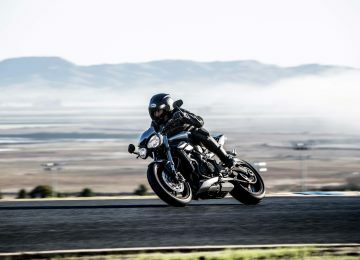 The range-topping Street Triple RS benefits from the highest-specification Showa big piston ø41mm front forks (adjustable for preload, rebound and compression damping), while the rear suspension unit is a premium Öhlins STX40 piggyback reservoir monoshock. 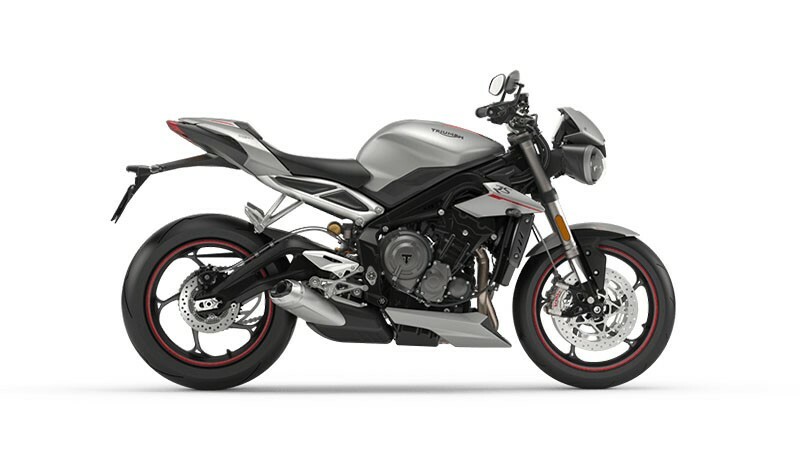 The mid-range Street Triple R has ø41mm upside-down fully adjustable Showa separate function big piston front forks with 115mm travel for improved riding comfort without compromise and a Showa piggyback reservoir monoshock rear suspension unit. And the Street Triple S comes with Showa upside-down ø41mm separate function front forks with 110mm travel and a stepped preload-adjustable piggyback reservoir monoshock rear suspension unit. STATE OF THE ART TECHNOLOGY: The new Street Triple represents the very best in rider technology, all designed to deliver the most exciting and engaging Street Triple ride ever, with up to five riding modes, new ride-by-wire, ABS, and switchable traction control, as well as full-color 5” TFT instruments, LED DRL* headlights (R and RS), and even a quickshifter and lap timer on the RS, the new Street Triple set a totally new benchmark. *Please note that the DRL function is not available in all markets – please check with your local dealer. Rear - Ohlins STX40 piggyback reservoir monoshock, 131 mm rear wheel travel.